Building Healthy Communities South Kern’s Education Justice Collaborative launched a media campaign to inform parents how the Local Control Funding Formula (LCFF) impacts their children. 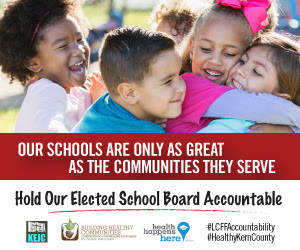 The campaign encourages parents to be familiar with their district’s Local Control Accountability Plan (LCAP) and provide feedback about the plan, which outlines how dollars will be used to student outcomes, to their school district. Look for our ads on billboards, local buses, and digital signs!